After picking many pounds of marionberries recently, I had to start getting creative. I’d already made jam, sorbet and tarts. (I’m officially banned from buying a separate freezer.) Then I recalled a marionberry barbecue sauce I’d made last summer, not the most obvious application of the berries. I found a recipe, switched up some of the ingredients, adjusted it till I arrived at a secret sauce, ready for pulled pork. Now, imagine your business is the pulled pork (or roasted tofu for you vegetarians). 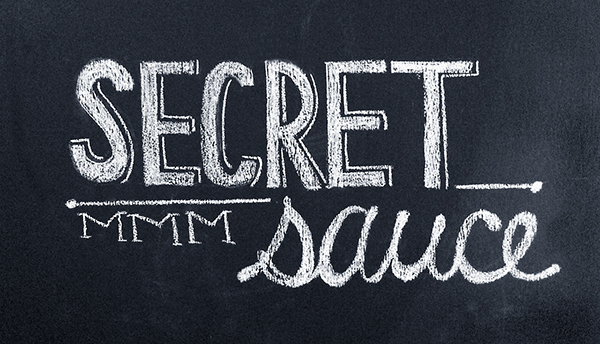 What’s your secret sauce? That set of ingredients that only you have that lend your enterprise a flavor all its own. In order to land on your secret sauce, you first have to embrace the idea that people need something to go on to pick you out of the crowd. Most businesses rely too heavily on the notion that because they exist, someone will want their product or service. Someone will eventually find them. Or they think their passion alone will carry them to success. This works well for those rare businesses that fill a peculiar niche. But even that lasts only so long. Soon, there will be many more shops serving bacon maple milkshakes. What makes you different is the very substance of your business. It defines your branding (both image and voice), it simplifies marketing efforts, it boosts confidence on the most trying days, it gives you connection-making mojo. Someone like me can tease out your secret sauce, put it into a larger context, refine it and put it into service. But you are a big ingredient in making that happen. A business that’s fully engaged in shaping their own brand benefits enormously, even if you can pay someone to do most of it for you. To be fully engaged means going beyond where you feel comfortable going. It means thinking through aspects of what you do that you hope to avoid, such as limiting yourself, living up to certain standards or, believe it or not, truly believing in how your endeavor will benefit someone. • An unexpected or distinctive personality or voice. • A surprising promise or set of promises. • A collection of traits that, while not individually unique, together, are refreshingly distinctive. • Using the stories or experiences of people who do business with you as a marketing tool in itself. • A very specific combination of what you do, combined with who it’s for (not moms or CEOs, but people needing “x” or worried about “y”) and how they benefit (really benefit). • Figure out what you can put limits around or make specific or singular. • A way you buck convention or call out what others won’t.